'Will the European Union meet the challenges of the 21st Century?' This was the question considered by participants in a conference held on 6 and 7 November 1997 on the occasion of the 40th anniversary of the Europa Institute of Leiden University. The congress resulted in a remarkable array of contributions, collected in this book. Together they not only reflect the significance; the positive outcome, the deceptions and the unfulfilled expectations; of the Treaty of Amsterdam, but they also constitute a stocktaking of the European Union as a whole. The contributions of the seventeen authors in this volume differ in their approach to the current State of the Union. Some contributions are highly political, as one might expect from a former President of the European Parliament (P. Dankert) or from a former Deputy Prime Minister of the United Kingdom (Lord Howe). Some are more descriptive in nature, some focus on the legal context of the negotiated texts, and several articles analyze central concepts of the European Union of the 21st Century. 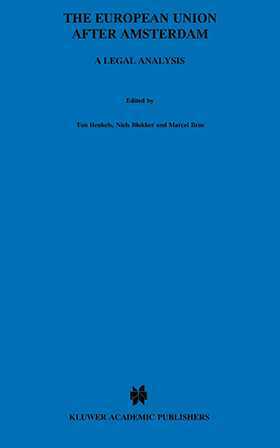 The publication of this volume demonstrates the intricate legal significance of the process of European integration, and it is hoped it will contribute to the better understanding and further development of the European Union.